Last summer we finally got a big TV. An HDTV actually. It’s great, but the HD part is dissapointing. The image has never looked that great. We use TiVo, which explains it. TiVo doesn’t work with HDTV. (Their new box does, but it’s $650.) So I figured the image wasn’t that great because we watch everything through TiVo. Except… well, when I watched through the direct input, it was better, but still not that great. Not as great as everyone else’s at least. Then my father (who has the same setup) told me that he had the cable guy out, and it turned out it had been wired wrong during installation. It sure would be nice if we were on Path I, wouldn’t it? How do we know what path we’re on, or how could we make an intelligent guess? Where do these lines come from anyhow? There is a lot of uncertainty about what the future may hold. So three different sets of assumptions are used, with different estimates of productivity growth, birth rate, immigration, etc. All three estimates are fairly conservative, which is good. We’d rather be surprised with something good than something bad, and we shouldn’t blithely assume that the good times today will continue. It’s worth examining some of these assumptions, since they affect so many political and economic decisions about our country’s future. If it turns out all three projections are overly-optimistic, then we’re all in big trouble. If it turns out that we’re on path I, then there is truly no Social Security issue — we might even be able to reduce payroll taxes a bit. To see the main assumptions that underly these three curves, scroll to the table at the end of this page. It’s well-worth clicking there to get a feel of the ranges we’re talking about. According to David Langer, model I has historically proven to be the most accurate. (I can’t find the original research, but this interview speaks to it.) He has also found that the numbers that underly those projections are made by political appointees, not independent actuaries and demographers. All the numerical assumptions are important, but the most important is probably the productivity growth rate of the US economy. The numbers are 1.4% (pessimistic projection), 1.7% (“medium” projection, that’s the basis of the 2042 date), and 2.0% (optimistic projection). Below are the annual productivity growth numbers for the USA, since 1948, courtesy of the Bureau of Labor Statistics. This averages 2.27%. The SSA’s optimistic prediction is 2.0%. The historical average is even more optimistic than the optimistic number used by the SSA! I’m not an actuary, there are undoubtedly other factors at work here, they might turn out to be much more right than I. But all else being equal, you would think the historical average of the last 58 years might be a starting point. Or at least not considered “out of bounds” when it comes to projections. I don’t know about you, but that makes me feel like there’s a good chance we’re on Path I.
We’re big fans of the all-you-can-eat Chinese Buffet. It’s great with young children. Second, there’s no waiting. As soon as you sit down, you get right up again to get your food. With kids, that’s a huge factor, the in-and-out time. What’s my problem? The drinks. You sit down, and get your food, but someone comes by to get the drink order. That’s a separate charge. Then you have to depend on the service for refills, and of course service is not the focus of these places. We often find ourselves vainly searching around for the one waitress to refill the drinks. The answer is obvious. The buffet should be all-you-can-eat and all-you-can-drink! It’s easier for patrons, it’s easier for staff, and it fits right in with the unlimited consumption theme. Just throw a Coke machine up near the food and let the customers at it. *How much should you tip when the staff doesn’t wait on you? I’m doing most of the work here. On the hand, per my tipping theory, I should tip more at the cheap places. I usually do 10% rounded up to the nearest dollar. Most people don’t understand how the Social Security system works. Because of this, it’s easy to believe untrue things about it. As a public service, Muttroxia is providing this Social Security timeline and “FAQ”. Early 1980s: The Social Security Administration looks ahead (as it constantly does), and due to trends it forsees, notably the retirement of the Baby Boomers, they predict they will need more funding in the future. 1983: Alan Greenspan leads the way to increase payroll taxes to build up the Social Security Trust Fund, building the surplus it will need when the Baby Boomers retire. Today: Aside from a bunch of alarmist rhetoric, nothing special is going on. We’re about $2 trillion dollars in the black. Let’s look towards the future. 2017 (approximate): We no longer put as much money into the system as we take out. Note that this does not mean there is no money there. We have spent about 34 years building up the reserves to about $2.5 trillion dollars, and now we start drawing down against it. Leaving that aside, what does a shortfall of 27% look like? Not much. When you have 35 years to address a problem, it’s pretty simple. Very small changes in the amount going in or going out are enough to eliminate that future shortfall. For instance, right now you pay Social Security taxes on your first $90,000 of income each year, anything after that is a free ride. Eliminating that cap, or raising it marginally, would be enough. Or you could raise the retirement age. Or you could means test. The portion of the Bush tax cuts going to the richest 1% of taxpayers alone will cost 0.6% of GDPâ€”more than the CBO projected shortfall of 0.4% of GDP. There’s any number of solutions, but what they share is that not much pain is required. If the gap even exists, it isn’t big, and we have plenty of time to close it. We’ve been in this position before. This isn’t the first time that we’ve looked far into the future and taken action. The scale of the problem is smaller than it has ever been. Let’s change topics. You might wonder what this mysterious fund looks like. Is there a federal bank vault filled to the brim with gold? Is it all just an accounting fiction? It’s a little bit of both. The Social Security Administration takes the money coming in and buys US Government bonds. Then it stores the bonds. When it needs to, it redeems the bonds. There’s a couple things to note about these bonds. First is that they are the most secure investment in the history of mankind. That’s not an exaggeration, there has literally never been a investment with lower risk. Second is that there is nothing magical about the bonds just because the Social Security Administration owns them. They are the exact same bonds that are owned by China, by Japan, and probably you. If you don’t have them in a drawer somewhere, the odds are good that any investment portfolio you’re part of will have some of them. 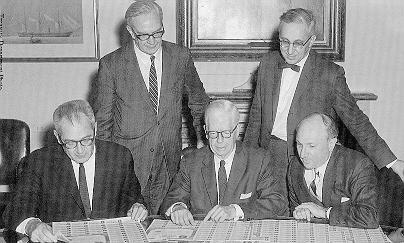 Above: Treasury Department and Social Security officials examining some of the Treasury bonds purchased by the Social Security Trust Funds in 1968. There are many who claim that the SSA doesn’t have any real money. â€œThere is no trust â€˜fundâ€™ â€” just IOUs that I saw firsthand,â€ Bush said. If those bonds are worthless IOUs, then the US Government is going to intentionally not pay off the bonds, not make good on it debts. That’s known as default, and it’s a big deal. Not only is this unconstitutional (“The validity of the public debt of the United States, authorized by law, including debts incurred for payment of pensions and bounties for services in suppressing insurrection or rebellion, shall not be questioned.”), terrible economics and likely to set off a world depression, but it couldn’t ever happen politically. As long as those bonds are owned by US citizens, and the more influential citizens at that, they will never let them be defaulted on. So the money is safe, safer than any other monetary vehicle. But wait, you may say, we still have to have money to pay for those bonds as they come due! Where is all that money going to come from? This issue of how the USA will find the money to make good on it’s debts has nothing to do with Social Security. This issue is a general problem about how the country uses it resources and plans for the future. Remember, there is nothing special about the bonds that the SSA holds. They are the same bonds everyone else has. So to the degree this is an issue (and I certainly believe it is), it is a general issue about the whole country and it’s future, there is nothing in it that ties it to Social Security. In other words, Social Security is in great shape. It’s the rest of the government that’s in trouble. Sadly, his last editorial was so incredibly offensive and wrong, I donâ€™t even know to write about. it. Iâ€™ll just quote extensively and see if anything comes to mind. No loyal Colts fan rooted for Indianapolis to lose the Super Bowl. No investor buys 100 shares of Google in the hope that Google’s stock will tank. No one who applauds firefighters for their courage and education wants a four-alarm blaze to burn out of control. Yet there is no end of Americans who insist they “support” US troops in Iraq but want the war those troops are fighting to end in defeat. The two positions are irreconcilable. You cannot logically or honorably curse the war as an immoral neocon disaster or a Halliburton oil grab or “a fraud . . . cooked up in Texas,” yet bless the troops who are waging it. Supporting the troops means that you support the individual soldiers, and the job they have to do. It means that you respect the choice they made to fight for their country, and want that choice to be respected by others. It means you respect the sacrifice they have made so that others donâ€™t need to. It means you want them to be well-trained, well-equipped, well-managed. It means you want veterans to receive care, that soliders shouldnâ€™t be preyed on payday lenders, etc. Mostly, it means that if they must sacrifice their lives, it must be for something worth sacrficing it for. But logic and honor haven’t stopped members of Congress from trying to square that circle. The nonbinding resolution they debated last week was a flagrant attempt to have it both ways. One of its two clauses professed to “support and protect” the forces serving “bravely and honorably” in Iraq. The other declared that Congress “disapproves” the surge in troops now underway — a surge that General David Petraeus , the new military commander in Iraq, considers essential. In Jacobyâ€™s world, there are two options. 1) Support the troops, and every military mission there is to the hilt. As long as the mission has been defined somewhere (ferinstance, â€œVictory in Iraqâ€, thatâ€™s a good one), you can never turn back. Didnâ€™t we do this already in Vietnam? Isnâ€™t that why the whole Support the Troops thing started, to distinguish the times from the Vietnam era? Do we really even need to hash this out again? * It turns out that spitting on soliders essentially never happened in the Vietnam era, or ever. It was one giant urban myth. For more on this, see here and here. In a different context that seems to apply to this very post, the author â€œ…believes that the “myth” is involved in helping to promote the yellow ribbon campaign; it has led some to think that for one to support troops, one must therefore also support the war, because it ties together the ideas of anti-war sentiment and anti-troop sentiment.â€ Touche, Mr. Jacoby! Two of my favorite episodes of Friends are ones about money, who has it and how it’s going to be used. Ross wants to split it equally, they rebel. PHOEBE: No, huh uh, no way, I’m sorry, not gonna happen. ROSS: Ok, Pheebs! How ’bout we’ll each just pay for what we had. It’s no big deal. MONICA: All right, what’s goin’ on? RACHEL: Ok, look you guys, I really don’t want to get into this right now. I think it’ll just make everyone uncomfortable. ROSS: Hello, it’s us, all right? It’ll be fine. JOEY: Ok, um, uh, we three feel like, that uh, sometimes you guys don’t get that uh, we don’t have as much money as you. RACHEL: That’s ’cause you have it. ROSS: That’s a good point. â€œEconomics for the Citizenâ€ â€“ A quick simple primer on economics, written in clear laymanâ€™s language. I agreed with over 90% of it! The best way to fold a T-shirt. I’ve tried it, it works. This one was sent in by Mike, a faithful reader. Yes, I have at least one faithful reader! MAPLEWOOD, Minn. (AP) – An airline pilot from Maplewood won a $25,000 lottery jackpot – two days in a row. Raymond Snouffer Jr. matched the winning numbers 11-14-23-26-31 to win Saturday’s Northstar Cash drawing with odds of about 170,000 to 1, Minnesota Lottery officials said. On Sunday, Snouffer stuck with 11 and switched to 3-7-19-28 – and won again. Just square the probabilities!!! The “virtually incalculable” odds are about 1 in 28.9 billion. (Working backwards, it appears that the structure is 31 numbers, of which you choose 5, which gives odds of 169,911 to 1. Assuming that’s true, the precise odds of winning twice in a row are 28,869,747,921 to 1. Welcome any Wikipedia readers. Note the parenthetical above, the probability of “this” happening depends on what you think “this” is.